Hi, all! 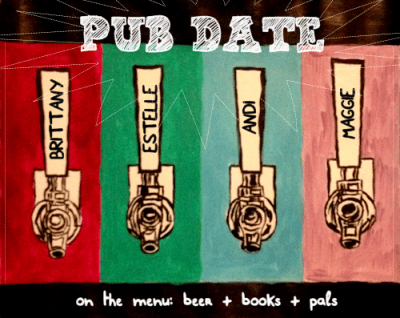 Welcome to back to our new feature called PUB DATE where Estelle from Rather Be Reading, Andi from Andi’s ABCs, and Maggie from Just a Couple More Pages and I all team up to pair books + beers in harmony! Each week, one of us will features a beer and a book of our choice, each with a different theme for that month! CHRISTMAS IS COMING, YOU GUYS. Less than a month to go and I’ve already decorated with outside lights (the first since I lived at my parents’ house!) and I think we’re getting our tree this weekend. (Live tree — we go to cut it down. Big stuff!!) For some reason, I’m WAY more excited about Christmas this year than previous years. Maybe because we get to decorate the house a lot more? Maybe because the Christmas spirit is catching on? I’m not totally sure… But I’m totally celebrating already! A lot of people read some annual Christmas or wintery reads, but truthfully, I don’t really have any (though I will be trying to watch Elf and some good selections on ABC Family’s 25 Days of Christmas!) 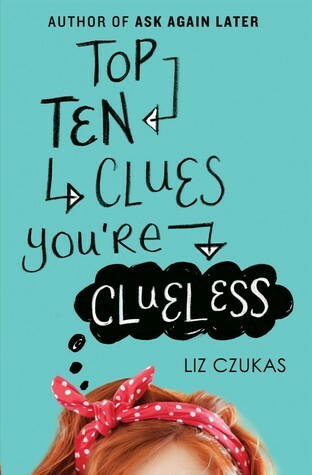 so I’m going with a book that I’ve already read and comes out NEXT WEEK (December 9th): Top Ten Clues You’re Clueless by Liz Czukas! I actually didn’t realize when I first started the book that it took place on Christmas Eve (or I did know that and totally forgot by the time I started it) so that was a pleasant surprise. Anyway — this book immediately put me in the Christmas spirit (back in October!) and I think it’s a super fun read for around the holidays. If you want to know more about the book, I reviewed it just a couple weeks ago! A Christmas beer. Well. I am not a HUGE fan of holiday beers. Some Christmas-y choices with spices are just too much for me and a lot of winter beers tend to be dark or heavy on the hops for some reason, so I was scared to try a designated Christmas beer, so I went with Bell’s Christmas Ale. I’m fairly confident in the beers that Bell’s makes and I usually enjoy them soI tried this one and I think it’s really quite good! The added flavors are not too strong and honestly, nothing about it really screams Christmas, but I’m totally okay with that because usually those flavors are too over powering. Two Brothers (a local brewery) has a Peppermint Bark Porter that sounds delicious in theory but I hate chocolate mint and I don’t like minty drinks (except for Shamrock Shakes) so I don’t think I would have gotten along with that one, but if you like those flavors, see if you can find that in stores! I’m interested to hear what you think. Thanks for joining us for another edition of Pub Date! Missed any posts? You can catch up at any time on my blog page for the Pub Date Feature! Powder Hound Winter Ale by Big Sky Brewing. American Amber/Red Ale // 7.20% ABV. I haven’t had this beer in a while but it’s been a long time since I’ve had a wintery beer. (Last winter? Ha.) I remember it being a lot more hoppy or maybe my palate has just evolved over the years! Anyway. I thought it was really good! Still a little hoppy for people who aren’t big beer drinkers but that’s common for ambers and reds. Cranberry Ginger Shandy by Leinenkugel’s. Fruit beer // 4.20% ABV. I know I talked about this one last month too, but I think it’s a nice choice for Christmas! Again, I don’t like either ginger OR cranberry but they go great together in this beer. 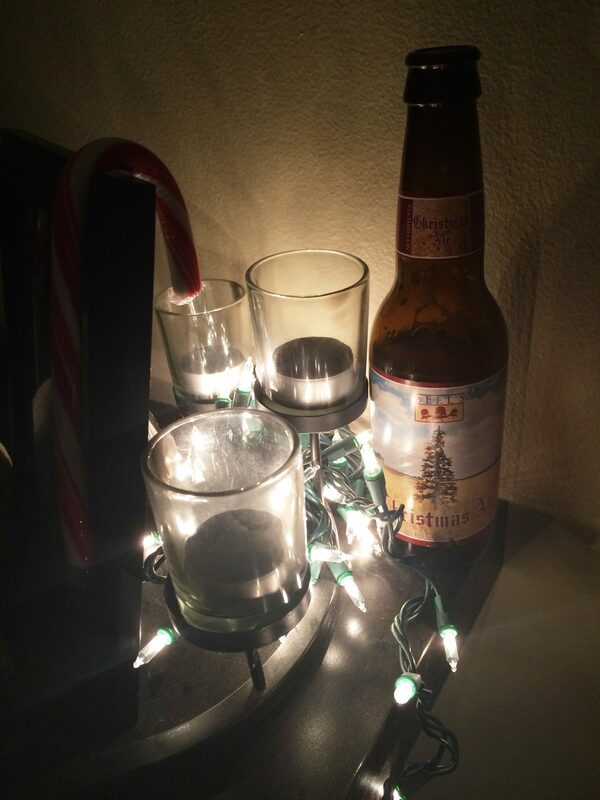 Light, fruity, and nothing too overpowering — I think it makes a nice Christmas shandy! Except I don’t know how to recommend this to you when the other two beers in the sample pack that’s widely available are terrible. Eek. Belgian Freeze by River Horse Brewing Company. Belgian Dark Ale // 8.00% ABV. This was a beer that Alyssa and Amy brought from New Jersey for me! I didn’t see it out of the bottle so I actually didn’t know this was a “dark ale”! Oops! It definitely was a little stronger and had a lot more of a heavy flavor than the lighter Belgians, though. Very delicious but I can really only drink one before it starts to sit heavy in my stomach (and before I start to get tipsy at 8% ABV!) but it’s quite tasty and I love trying beers from new places! Pub Date  | Halloween + Horror Pub Date  – Resolutions Pub Date  – Fall Pub Date  – Wedding! This entry was posted in Books, Pub Date and tagged Beer, Books, Pub Date, Wedding, Weddings on December 5, 2014 by Brittany. Ooh! This one looks good! Thanks for sharing! I am going to keep my eyes peeled! I will forgive you for not liking holiday beers. I think I’ve only had a few holiday beers and they just weren’t my style. Clearly there are good ones out there! I need to try more! YES the only minty drink worth drinking is a Shamrock Shake. I love beer and really should try to be more adventurous with it. I tend to stick to the tried and true favorites because I’m afraid of buying a 6 pack of a beer I end up hating! haha.